Floodlights situated across from the Center light the Ginkgo trees in front of the reflecting pool. Spanning the pool just in front of the sphere is a light column custom made to spill light on the exit path that leads to either side of the structure. 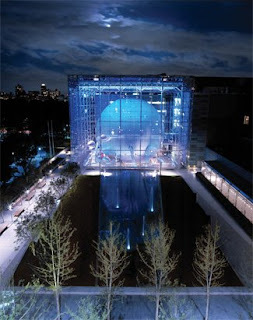 The American Museum of Natural History in New York City and its Arthur Ross Terrace linking to the Frederick Phineas and Sandra Priest Rose Center for Earth and Space, presenting to the public the evolution of stars, galaxies and planets. "The simple terrace of stone at the entry to the new public space is the western destination of the central “shadow.” It is separated from the rest of the plaza with a line of white granite seating steps. This area is planted with a group of Ginkgo trees. The Ginkgo is the only surviving species of a family of trees that originated during earth’s carboniferous period, some 300 million years ago. As these trees mature into a shady grove, the boughs of brightly colored “fossil leaves” will frame the view of the Rose Center on the other side of the plaza. In the fall, the bright green leaves of the trees will transform into a glowing clear “solar” yellow. Moveable café tables and chairs on the upper terrace provide flexible social opportunities."